Luxe ReadyTheme by Miva, Inc. The Luxe ReadyTheme adds high end design and sophistication to any Miva store. Featuring clean lines and beautiful graphics, it is the perfect theme for any industry or product line needing imagery to lead the way. But beyond great looking graphics, this theme comes packed with cutting edge features. First, it is a 100% width theme, expanding to fill the space on any size monitor. 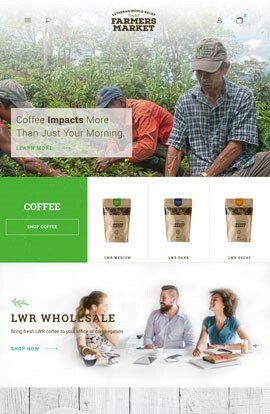 Next, this theme takes the right side menu introduced in StoryTeller which showcases the basket contents and adds an additional complementary layer with a left side flyout used for store navigation. These two slideouts paired with subtle animations throughout the site and fading in graphics as they are lazy-loaded in the background for speed and performance give the theme a playful yet unique browsing experience. This theme is the first ReadyTheme to come packaged with a two alternate category layouts. These alternate layouts expose Attribute Machine on the category page allowing color swatches to be displayed and clicked to swap out the image. WIth a built in Quick View, the category page provides a feature rich browsing experience for your customers. The product display page of the Luxe theme is all about the product image. Front and center it commands half the screen and high quality product photos are a must. With a touch friendly slider, it makes viewing additional images a breeze on mobile devices. The product page also features built in product tabs, related products and the ability to add lifestyle photos in beautiful collage. Finally, the checkout process of the Luxe theme creates a streamlined optimized customer experience. The navigation gets stripped out to remove distractions and the right side of the screen is used to display the cart contents and a summary of Billing and Shipping information with easy editing. Take your Miva store to the next level with the Luxe ReadyTheme!